In the early morning of March 7th 2003, Sander van Nunen and Sander Zuidema took off to Schiphol airport Amsterdam to take a plane to Madrid. 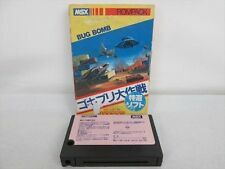 Their mission: Visit the MadriSX international MSX fair on behalf of the MSX Resource Center, meet spanish MSX users in person, show the japanese MSX magazines, demonstrate the latest version of Meridian and offer some Japanese games for sale. The arrival on the airport went smoothly and - thanks to the directions given by Rafael Corrales of MSX Power Replay - the hotel where we were spending the coming nights was found straight away. Contrary to the expectations the weather was really nice, so we decided to take off to Retiro park, where we spent the afternoon. After a bit of sleep we went out to meet Sunrise, Power Replay and some Spanish friends to have dinner in a small restaurant that was barely capable to serve 12 people at a time. However, the atmosphere was great, it was the best preparation for the fair which was to be held the next day. We arrived at El Greco just in time to set up our stand before the visitors came in. Right from the start, many visitors and stand holders showed their interest in the games we were selling. With the help of a few Spanish MSX users capable of speaking a bit of English, we could more or less communicate with all the visitors of the fair. When this first wave of attention on our stand was over, we finally had the time to look around and see what the other stand holders had to offer. Next to the MRC stand was the group with the -for the dutch- unpronouncable name Desgalitxat MSX. They were selling many MSX1 and MSX2 games, framed posters of popular MSX game covers and T-shirts with prints of MSX game covers (many of the visitors were wearing shirts like that). Calamar group was there to sell MSXKun's new game MSX Hot numbers, RGB cables and their adaptors to connect Playstation controllers to MSX computers. IVI & Sapphire soft had taken the new Mega FLASH ROM cartridges with them. On the same stand there were 2.5" harddisks and SD-Mesxes magazines for sale. One could even buy new software, like Internestor and Cat 'n Mouse. <a href=http://perso.wanadoo.es/replay/hindex.htm target="_blank"><b>MSX Power Replay[/url], who organized the fair, had a stand as well, selling items they had in stock. Next to them, the famous MSX user Martos was selling CD-ROMs and magazines. Last but not least, Sunrise was present to sell new MSX hardware like Moonsound, IDE cartridges, CompactFlash interfaces and adaptors and GFX9000 video cards. Also, the visitors could have a look at the eZ80 webserver. Throughout the day, there were games and demo's on the huge projection screen behind the stands. After noon, Rafael Corrales went from stand to stand with a wireless microphone, in order to give every stand holder the opportunity to tell something about the products they had taken with them. For instance, Sunrise talked about the upcoming MSX ehternet card, IVIsoft about porting/emulating ZX Spectrum games on MSX and Snout gave a quick demonstration of Meridian, instantly translated to spanish by Rafael. By then, the time had come to have dinner. The visitors of the fair divided into two groups. One staying at El Greco, to have some food there. The MRC crew joined the people who went out for another restaurant. It was nice to walk around a bit in the sun and see the surroundings of this Madrid suburb. After a long dinner, we returned to El Greco. In the last 2 hours of the fair, people were mostly chatting with each other or playing games. Sander and Snout were still tired because of the trip and decided to stay a bit outside, enjoying the sunny weather. After saying goodbye to all our old and new MSX friends we packed our bags and returned to our hotel in Madrid. After two more days of enjoying the sun, the city and a bit of the nightlife, the days of the MSX Resource Center crew in Madrid were over. On our last day in Madrid, we were capable of finding several @rroba magazines in which an interview with the MRC crew could be found. We were very pleased and proud to see the URL of our website printed on the cover of this magazine. Satisfied and extremely tired, we took the flight back home. The MSX Resource Center would like to thank Rafael Corrales for all the help during the first two days in Madrid.